O God, who show the light of your truth to those who go astray, so that they may return to the right path, give all who for the faith they profess are accounted Christians the grace to reject whatever is contrary to the name of Christ and to strive after all that does it honor. Through our Lord Jesus Christ, your Son, who lives and reigns with you in the unity of the Holy Spirit, one God, for ever and ever.er. Seven Principles of Catholic Social Teaching | Christopher Kaczor Ph.D. Historically today is the feast of the holy abbot Arsenius. Before he left the world and retired into the desert, he led an innocent and saintly life at the court of Theodosius the Great, who had entrusted him with the care of the education of his children. It is also the feast of St. Aurea, Roman Catholic Martyr of Spain. She was born in Cordova, Spain, in the ninth century to Muslim parents. She was also the sister of Ss. Aldolphus and John, who were martyred at Cordova. Aurea became a Christian after her husband died, and took the veil at a monastery in Cuteclara, Spain, where she remained for more than twenty years. She was ultimately denounced as a Christian by her parents, and received a martyr’s crown by beheading in 856. According to the 1962 Missal of St. John XXIII the Extraordinary Form of the Roman Rite, today is the feast of St. Vincent de Paul, Confessor. His feast in the Ordinary Form of the Roman Rite is celebrated on September 26. .
Arsenius was born to two rich parents in A.D. 350 in Rome. His father was a senator and judge. His parents were very righteous and honorable people. They sent Arsenius to the teachers of the Church and was raised in the fear of God. He was eager to read the Scriptures and the holy books, and was ordained a deacon then an arch-deacon by Saint Damasus the Bishop of Rome. After his parents died, his sister Afrositty and he gave all their riches to the poor, and lived an ascetic life. Arsenius became famous for his righteousness and wisdom. He was a disciple of Rophenius the monastic historian from whom he admired the Egyptian monastic life and its fathers, and he wished to meet them. When the Emperor Theodosius the Great wanted a man to whom he might entrust the education of his children, Saint Damasus recommended Arsenius, a man of senatorial rank learned in both sacred and worldly knowledge. Arsenius accordingly went to Constantinople in 383 A.D. and was appointed to the post by Theodosius who, coming once to see Arcadius and Honorius at their studies, found them sitting whilst Arsenius talked to them standing: at once he caused Arsenius to sit and ordered them to listen to him standing. But neither then nor in after-life were the two augusti any credit to such a father or such a tutor; added to this Arsenius had always a tendency to a retired life. When therefore after over ten years at the court he seemed clearly to hear the voice of God through the Gospel, "For what is a man profited, if he shall gain the whole world, and lose his own soul?" (Matthew 16:26). He left Constantinople and came by sea to Alexandria and fled into the wilderness. When he first presented himself to Abba Macarius the Great, the father of the monks of Skete, he recommended him to the care of Saint John the Dwarf to try him. In the evening, when the rest of the monks sat down to take their meal, Saint John left Arsenius standing in the middle without inviting him. Such a reception was a severe trial to an ex- courtier; but was followed by another much rougher, for Saint John took a loaf of bread and threw it on the ground before him, biding him with an air of indifference to eat it if he would. Arsenius cheerfully sat on the ground and took his meal. Saint John was so satisfied with his behavior that he required no further trial for his admission, and said, "This man will make a monk". Arsenius at first used thoughtlessly to do certain things which he had done in the world, which seemed inappropriate to his new companions, for instance, to sit cross-legged. The seniors were unwilling through the respect they bore him to tell him of this in public, so one agreed with another that he should put himself in that posture and then be rebuked for his immodesty. Arsenius saw that the reproof was meant for him, and corrected himself of that trick. Being asked one day why he, being so well educated, sought the instruction and advice of a certain monk who was an utter stranger to all literature, he replied, "I am not unacquainted with the learning of the Greeks and the Romans; but I have not yet learned the alphabet of the science of the saints, whereof this seemingly ignorant Egyptian is master". Evagrius of Pontus who, after he had distinguished himself at Constantinople by his learning, had retired into the desert of Nitria in 385, expressed surprise that many learned men made no progress in virtue, whilst many Egyptians, who did not even know the letters of the alphabet, arrived at a high degree of contemplation. Arsenius answered, "We make no progress because we dwell in that exterior learning which puffs up the mind; but these illiterate Egyptians have a true sense of their own weakness, blindness, and insufficiency; and by that very thing they are qualified to labor successfully in the pursuit of virtue". Arsenius often passed the whole night in watching and prayer, ad on Saturdays it was his custom to go to prayers turning his back to the evening sun, and continue with his hands lifted up to Heaven till the sun shone on his face the next morning. One of the emperor's officers brought him the will of a senator, his relation, who was lately dead, and had left him his heir. The saint took the will and would have torn it to pieces, but the officer begged him not to, saying such an accident would get him in trouble. Arsenius, however, refused the estate, saying "I died eleven years ago and cannot be his heir". He employed himself in making mats of palm-tree leaves; and he never changed the water in which he moistened the leaves, but only poured in fresh water upon it as it wasted. When some asked him why he did not cast away the filthy water, he answered, "I ought to be punished by this smell for the self-indulgence with which I formerly used perfumes". He lived in the most utter poverty, so that in an illness, having need for a small sum to procure him some little necessities, he was obliged to beg for it. Due to his desire for quiet and solitude, Saint John allowed Saint Arsenius to live alone in a hidden cave in the desert 32 miles away. He would seldom see strangers who came to visit him, but Theophilus, Pope of Alexandria, came one day in company with others to visit him, and begged he would speak on some subject for the good of their souls. The saint asked them whether they were disposed to comply with his directions; and being answered in the affirmative, he replied, "I entreat you then that, whenever you are informed of Arsenius' abode, you would leave him to himself and spare yourselves the trouble of coming after him". He never visited his brethren, contenting himself with meeting them at spiritual conferences. The abbot Mark asked him one day why he so much shunned their company. The saint answered, "God knows how dearly I love you all; but I find I cannot be both with God and with men at the same time; nor can I think of leaving God to converse with men". This disposition, however, did not hinder him from giving spiritual instruction to his brethren, and several of his sayings are recorded. He said often, "I have always something to repent for after having talked, but have never been sorry for having been silent". Nothing is so much spoken of about Arsenius as his gift of tears, weeping both over his own shortcomings and those of the world, particularly the feebleness of Arcadius and the foolishness of Honorius. 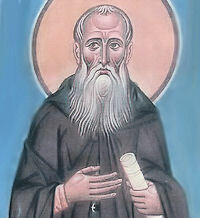 Saint Arsenius was tall and comely but stooped a little in his old age; he had graceful carriage and a certain shining beauty and air of both majesty and meekness; his hair was all white, and his beard reached down to his girdle, but the tears which he shed continually had worn away his eye-lashes. He lived in the same austere manner till the age of about ninety-five; he spent forty years in the desert of Skete, till a raid of barbarians compelled him to forsake this abode about the year 434. He retired to the rock of Troe, over against Memphis, and ten years after to the island of Canopus, near Alexandria; but not being able to bear the neighborhood of that city, he returned to Troe, where he died. His brethren, seeing him weep in his last hours, said to him, "Father, why do you weep? Are you, like others, afraid to die?" The saint answered, "I am very afraid - nor has this dread ever forsaken me from the time I first came into these deserts". Notwithstanding his fear, Saint Arsenius died in great peace, full of faith and of that humble confidence which perfect charity inspires, in the year 445. St. Aurea was one of the Córdoba martyrs. The city of Córdoba had been Christian from apostolic times until the Islamic conquest came to southern Spain in the year 711. Soon Córdoba became the capital of this part of the original "Islamic State", and would remain so until the 15th century. During this whole period the Church continued to exist, but she was subject to sharia (Islamic law) which forbade public witness and imposed jizya (a special tax). Things became more complicated as Córdoba grew into a prestigious economic and cultural center in the Islamic world. Catholic churches and monasteries remained, but the population — attracted by the many opportunities in the Muslim city — began converting to Islam. Even prominent churchmen cooperated with the political regime in ways that compromised their integrity. By 800, few remained professing Catholics. A significant portion of the population, however, conformed externally to Islamic laws and customs but tried in various ways to remain Christian privately or even secretly. Though sharia law permitted Christians to exist, it forbade Muslims to convert to Christianity. This was regarded as the crime of apostasy, punishable by death. The problem of "secret Christians" in Islamic Spain was especially complicated by the inevitable mixed marriages between Muslim men and Christian women. The latter were generally permitted to retain their faith, but the children of such marriages were considered Muslim by sharia law. It is impossible to gauge the influence of these Christian mothers on their children, but it was not negligible. Thus, by the 9th century Córdoba was institutionally and legally Muslim and what was left of the Church was largely compliant. But this period also documents the witness of forty-eight Córdoba Martyrs. Many were Christians executed for blasphemy because, in seeking to reinvigorate the Church, they openly proclaimed Christ and denounced Islam. But there were also apostates among them. Saint Aurea illustrates what may have been the hidden truth for many others born of mixed marriages. She was one of several children of a prominent Muslim father and a Christian mother. Her mother must have been an outstanding woman of faith who raised her children as believing Christians. When Aurea was young, two of her brothers were martyred. Sometime after this (and after her marriage and widowhood, about which nothing is known) Aurea joined her mother in seclusion in a convent outside the city. A significant portion of the population, however, conformed externally to Islamic laws and customs but tried in various ways to remain Christian privately or even secretly. Open Christian witness was met by further Muslim persecution in 850, and it became increasingly unsafe for Christians like Aurea, who were legally Muslim by birth in spite of growing up as Christians and personally embracing the Christian Faith. Relatives from her Muslim father's family found Aurea after twenty years of undisturbed peace in the convent and brought her before the sharia court. To avoid being condemned for apostasy, Aurea did what many other secret Christians did to escape: she declared adherence to Islam and its prophet. She repented, however, almost immediately after being released, and returned to practicing her Christian faith. Her Muslim relatives denounced her again, and this time she was executed on July 19, 856. We have presented Aurea as a convert even though its possible that she was baptized a Christian at an early age. Nevertheless, she was martyred because Islamic law regarded her as a convert — an apostate — simply because of her free adherence to Jesus Christ. Excerpted from John Janaro "Saint Aurea of Cordoba." Magnificat (April, 2016). A contemporary of the American Revolution and of Blessed Junipero Serra, Francisco Garcés was born in 1738 in Spain, where he joined the Franciscans. After ordination in 1763, he was sent to Mexico. Five years later he was assigned to San Xavier del Bac near Tucson, one of several missions the Jesuits had founded in Arizona and New Mexico before being expelled in 1767 from all territories controlled by the Catholic king of Spain. In Arizona, Francisco worked among the Papago, Yuma, Pima and Apache Native Americans. His missionary travels took him to the Grand Canyon and to California.